About a month ago I finished replaying the Uncharted series for the 3rd time (1st time streaming). They are still by far some of my favorite games. I had an absolute blast sharing them with people. The answer to that one is easy. The 2nd one, Among Thieves. The way the story is framed in the beginning grabs your attention and the rivalry between Drake and Flynn was very well done, with Chloe as their go-between. The villain was dynamic and intimidating. It was great. A Thief’s End (Uncharted 4) is a close second, being the absolute PERFECT way to end the story. The story of two brothers working together to finish their mother’s greatest work, intertwined with a tale of obsession and the destruction it can create. Then there is the first one, Drake’s Fortune, that started it all. It did a fantastic job of introducing us to the main cast of characters. The treasure was one whose name everyone is familiar with, the villains had interesting personalities, and the twist was very cleverly crafted. Without its success, the others might not have existed. The third game, Drake’s Deception, is the least favored of the games. The story was not as strong and some of the animations felt a little weird (but that happens sometimes). It was not a bad game, it just was not as good as the rest of the series. I have been thinking about it for some time now and after my last playthrough, I have a few ideas on how to bolster the story in a way that would improve the overall experience. The name is Drake, Nathan Drake. This game definitely has a James Bond vibe to it. I mean, it starts in a very British bar brawl and some super sneaky tricky spy stuff. The villains, Marlowe and Talbott, are supposedly members of a secret spy organization that has been in existence since the time of Sir Francis Drake. There wasn’t much talk about the organization itself, though. I would love to have focused more on that aspect. What is their purpose? How did they know about Sir Francis Drake’s mission to find the Lost City of Ubar? How did they know there would be something there worth finding? Why do they want it? It sometimes felt like they were leaning too hard into the James Bond vibe while neglecting some of what makes Uncharted unique. Nate is not a secret agent. He is an explorer, an archaeologist, a historian, and, most importantly, a thief. He makes mistakes. He makes bad puns. He is goofy. I feel like we didn’t get to see as much of that, but that could just be me. There was also not as much focus on the history and lore surrounding the lost city and treasure itself. The game focused more on the competition with Marlowe and less on what they were hunting for. That could have played a part in why people did not get as invested in the story as they did with the other games. Marlowe, Marlowe, Marlowe. Where do we even begin? She is very enigmatic, very British, and very lacking in a background. We catch a glimpse of her relationship with Sully in the flashbacks to how Sully met Drake. There is no explanation as to why she needed Sully to help her get the ring, why she wanted it, or even how she and Sully know each other. Throughout the entire game, Sully doesn’t tell us anything about her that we didn’t already know, even though it was pretty clear he knew her well given their embrace during the flashback. We also learn that she knows about Nate and how Sully took him in. Yet we are given very little information on her. We also have Talbott, who is her second in command and obviously very attached to her, given his anger at her death (spoilers). That is all we know about him and their connection. I want to know more about their position in the organization as well as their connection. I want to know why they have been sent on what is basically a wild goose chase. What are they hoping to accomplish? We know that Drake and Elena were together. They both have rings. They are obviously not together anymore. I have two questions about this. Were they married or engaged? Some people may say it was married because he had a ring, but sometimes the guy gets an engagement ring as well. Second, what did Drake do?! Things are definitely tense between Drake and Elena. He screwed things up somehow. We don’t know how long it has been since they broke up. I just want to know what happened! All in all, it was not a bad game. The puzzles were fun and challenging. The scene with the plane was a lot of fun to play through. The Lost City of Ubar was absolutely gorgeous. And the ending was satisfying as we see Drake and Elena reunited once more. I just wanted more of the story and the culture and the mythos surrounding the lost city and the treasure. I really did enjoy this game and I absolutely love the series. Analyzing the stories is a great though exercise and a good way to study story structure. There is something beautiful about the kind of storytelling that is found in video games. You can get lost in a book or a movie, but it isn’t the same level of immersion that you can find in video games. Games allow you to live the action instead of just witnessing it. I think that is why most people play video games. There may be different reasons behind it, but at a basic level, video games provide some level of escapism. I know that I personally use games as a way to dive into another world for a period of time. Ever since I started gaming a few years ago, there is one thing, in particular, I have fallen in love with when it comes to gaming. I am talking about the power to make decisions. The first two series I played through were Mass Effect and Dragon Age. I was floored by the impact my decisions had on how the story unfolded. I think that might be part of why I got so hooked on the games. There is something thrilling about being the only hope for the world in the face of some great darkness. Add on to that the fact your decisions can actually affect the outcome…it is easy to get sucked in. These games force you to think about where you stand on tough issues. They put you in uncomfortable situations where you have to make a choice whether you want to or not. Many people say that the games punish you for making the “wrong” decision, but that isn’t necessarily true. They just force you to live with the consequences of those decisions. Sometimes they even go so far as to back you into a corner where there is no “right” decision, but you still have to choose. Who do you save? Who do you leave behind? How do you decide between two bad options? While these decisions can be incredibly difficult, even painful for players, they are important. They remind us that sometimes, there is no right choice. Sometimes, you can’t win. You still have to choose. Video games have the unique ability to let you live through situations you will never have to face in real life. They make you tackle complex issues on a broader scale than most people would ever have to consider. They make you take a long, hard look at your beliefs. They make you reevaluate your moral compass. The way you look at the world. They also put you in some really tough situations where one wrong decision could have disastrous consequences. The interactivity of games, especially the decision-based, narrative-driven games, makes it feel real. That is why it is so easy to get sucked into the games. You become emotionally invested in the characters and in the world itself, which makes the lessons you learn feel so much more real. It also makes the consequences of your decisions that much more painful. Games offer one thing, though, that real life doesn’t. The ability to try again. To start over with a slate that is truly clean. You can play the hero, the villain, even a god in some cases. You can wreck as much destruction as you want or work to the best possible outcome. Then you can start everything over again, doing it differently. It is something you will not find anywhere else. In the 300th issue of Game Informer, they listed the top 300 games of all times. Mass Effect 3 was ranked #99 (above Breath of the Wild!). Yet I would be willing to bet money that there are still people who hate the ending. The most popular argument is that the options you are given in the end don’t match up with the common themes of the game. There are also MULTIPLE jokes about color coded endings. You have the paragon and renegade control endings. The Reapers prefer the synthesis ending (it personally creeps me out). And then you have the destroy ending, the one ending I can’t bring myself to chose. I even have my own indoctrination theory about how the Reapers have been unintentionally indoctrinating all organic life towards their way of thinking throughout the entirety of their existence. More of that later. Back the point of this post. My defense of the ending of Mass Effect 3. No matter what your opinion of the ending is, there is one thing you probably haven’t considered. How many times have you replayed the series? I am currently on my third play through. The ending punches me right in the gut each time I play. It doesn’t matter that I pick the same ending, it still tugs on every single one of my heartstrings. If there had only been one ending, it would not have had as much of an impact. If the ending had been everyone living happily ever after, I may not have been as compelled to live through the story again and again. This is a game where all of your decisions matter. Where you represent the hope for the future. So, what happens if, in the end, you refuse to decide? Then it is game over for everyone. The only way to ‘lose’, is to chose not to chose. I don’t know about you, but that strikes me as profound. You can dislike the ending. You can wish there was something more, some way Shepard could survive. But you will still keep on playing the story over and over again. 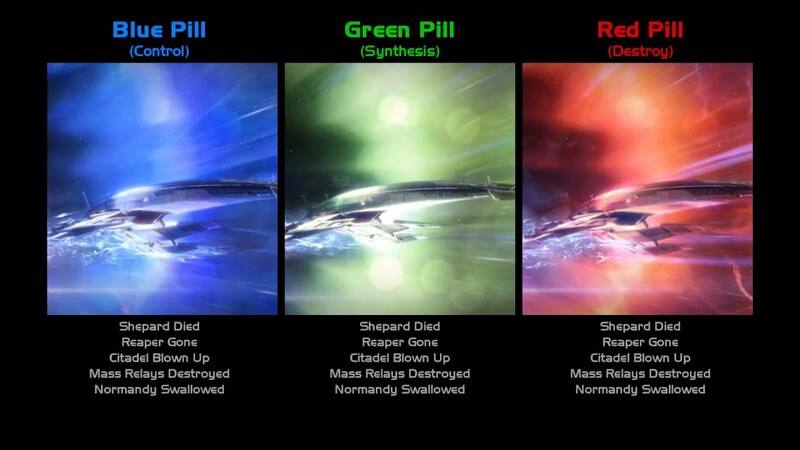 You will relive the story of Shepard, maybe making the same choices, maybe not. You will never forget the power of having your choices matter. You will never forget the power of knowing that Shepard’s story will live on. What legacy did your Shepard leave behind?